Many different plants could be included in a rock garden. The usual design approach limits plant selection to low-growing varieties, but this is not a necessary constraint. A brief study of the vegetation on a naturally occurring rocky landscape would help in designing a realistic rock garden for a residential landscape. Some travel could be required to locate one or more good examples; this could be a pleasant weekend excursion with a clear purpose, especially if one knows where to find rocky landscapes. Ask around! Once found, rocky landscapes might include one or more trees of various sizes, as well as shrubs and smaller plants. Clearly, proximity to rocks does not limit the size of plants. A late July scene in the rock garden of the University of British Columbia Botanical Garden; photo by Todd Boland. The assumption that rock garden plants should be low-growing specimens probably relates to alpine gardens, which have inspired many rock gardens. Alpine gardens feature plants that grow naturally in high-altitude, mountainous areas, which typically have large stones and much gravel, low temperatures, low moisture, and poor soil nutrition. Plants that survive under such conditions might very well be small in overall size and low growing. 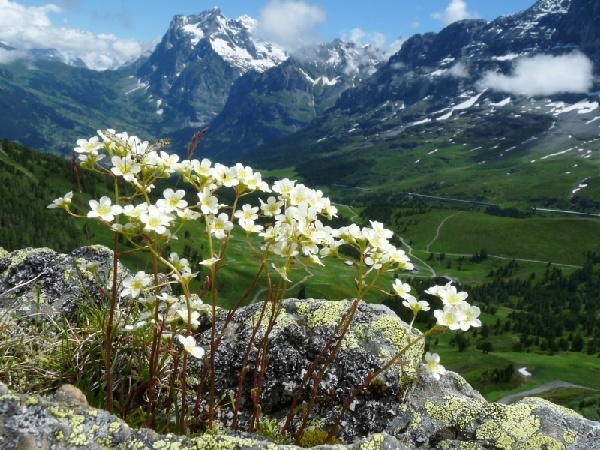 Developing an authentic alpine garden, however, involves reproducing the challenging conditions in which alpine plants are found. There are alpine varieties of some familiar garden varieties, e.g., Campanula, Dianthus, Geranium, Phlox, Primula, Ranunculus, Sedum, Sisyrinchium, Thyme. If such plants were to be grown in a moderate climate, in rich soil and with ample moisture, they would respond with more lush growth and greater size than they would in a true alpine garden. 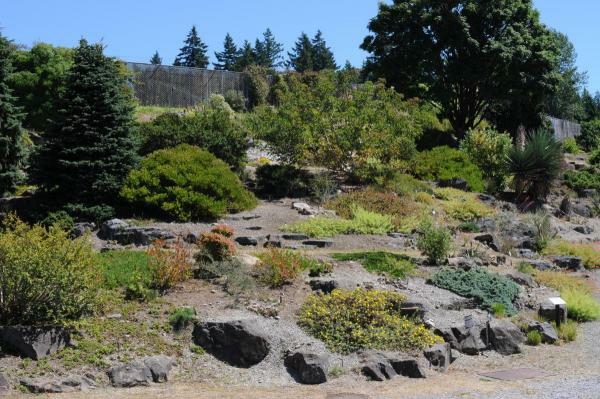 Rock gardens should not be confused with alpine gardens. In fact, rocky landscapes can and do occur in a wide range of climates, with the only common characteristic being exposed rocks. So, in planting a rock garden, the gardener should first select plants that will thrive in the local environment. The Monterey Bay area’s climate supports a wide range of choices. The rock garden designer still might want to emphasize low growing plants to keep the vegetation in scale with the surrounding landscape and the rock garden itself, and to keep the rocks visible (they might have required a significant investment). Another consideration is the relationship of the plants to each other. This perspective might lead to developing a plant community, i.e., a grouping of plants that grow together in nature. Other possibilities include a thematic approach, e.g., a white garden or an analogous or complementary color scheme. In our moderate local climate, the designer also might plan for year-round seasonal color, or for interesting contrasts of foliage or structure. There are many possibilities, but the most successful and satisfying landscape plans always are based on a plan of some description, rather than a series of impulsive decisions. The website invites—and requires—exploration to discover its many riches. North American Rock Garden Society – Another good source of plant images and descriptions. Not as extensive as the Alpine Garden Society’s website, but helpful as an introduction to rock garden plants. At the site, click on “Plants” for the entry to lists and images. Rock Gardens & Ground Covers A page of unorganized photos submitted to Pinterest. Interesting to scroll through, to see some very good plant pictures, some attractive designs (more or less naturalistic) and some truly bad designs (but that’s one person’s opinion). Scottish Rock Garden Club – This website provides free access to many back issues of The International Rock Gardener, an excellent publication.